Post-Script: Of course, I haven't tried every ribbon supplier out there, so there's more exploration to do. One of my YouTube viewers suggested an Etsy supplier of cotton ribbons, which I'll have to try out and review. Another suggested FJA Products, another good supplier. 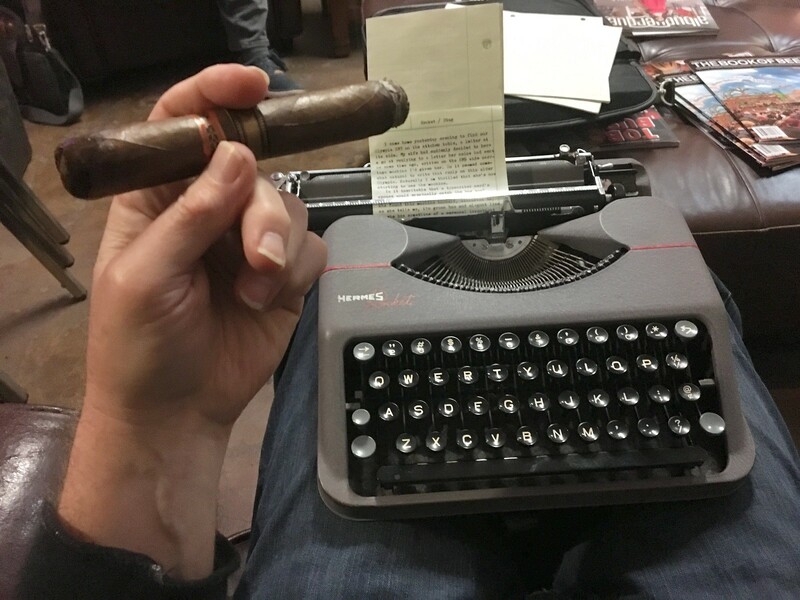 Blog articles like this one aren't spectacularly informative, but they do represent the ongoing lifestyle of a typewriter aficionado, living with these machines, taking them to the cigar store lounge to write a blog article about taking a typewriter to the cigar store lounge. Self-referential, yes; but I think it's an important aspect of typewriter culture, documenting how we live with, and use, these mechanical wonders, mundane as that might seem. On a technical note, I like to fold this green engineering paper in half when typing a narrow column for this blog, especially with the Rocket's 13 CPI typeface. So the left edge is creased and the right is open, when threaded through the platen rollers. But the right side must have fed faster than the left, because in the scan you can see the lines of text start out at the top slanted toward the left and end up slanted toward the right at the bottom of the page. Probably some subtle pressure roller issue in the carriage, but nothing that's going to keep me up at night. I should be just left the paper unfolded and used a backing sheet. In the resulting video, linked below, I have some wonky audio issues, caused partly by a weak battery in my dynamic mic's preamp, which spoiled the video's overall quality, since audio is so important of an aspect to video. I tried to even out the clips' levels, but it's still rather awful. I need to take better care next time. I have a number of video projects needing to be made, but my time these days has been occupied with edits and rewrites for my Cold Hard Type short story project. I've also been holding off on another typing assignment until the deadline has passed, because I know a number of participants to the series that are also in the midst of writing their Cold Hard Type stories. Last night I spent hours typing changes to the story on my Royal QDL, while today I once again broke out the Olympia SM3 to type a neat copy incorporating all the changes thus far. While the Royal is a darned good machine, the SM3 is yet a cut above. I hope to get one more video done this week. Wish me luck, and that the quality will be up to par. Next thing you know Mrs. VC will have typewriters following her home. Tony Casillo sells cloth ribbons on metal spools and they work great. I use FJA they are fast, but the ribbons are nothing to brag about. Last silk ribbons I got came from Baco or Jay Respler. I've had a blue silk on my first H3k going on 8 years now and it still prints great. Thanks for this post. I have been working on typing my story but my pages look unevenly inked. I suspect that what I need is a new silk ribbon.